Finding a way of legalising the status of 50,000 undocumented Irish in the United States would make America a better country, Taoiseach Enda Kenny has said. On the first leg of his five city tour of the US Mr Kenny sought to set the tone for his St Patrick's Day engagements by promising to prioritise a push for immigration reform. 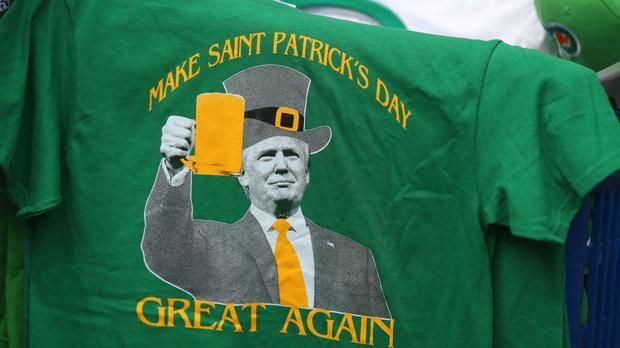 He told the Friendly Sons of St Patrick society in Philadelphia that it should be "no surprise" that he raise the issue with Donald Trump later this week. The Taoiseach wants "to renew the strong case on behalf of the hard-working, tax-paying Irish people in the United States who for too long now have been living in the shadows, and want nothing more than to continue making their contribution to this great country". "We all understand that immigration reform is a politically sensitive issue. However, I truly believe that a US immigration system that addresses the needs of the undocumented Irish, and provides for future legal flows, will be of huge benefit to America," he said. The Friendly Sons of St Patrick is America’s oldest Irish society but until this year was exclusively for men. However to mark its 245th anniversary in March the Philadelphia chapter has inducted Irish Ambassador to the US Anne Anderson as the first honorary female member. Mr Kenny described the move as a "just and courageous step forward". "I was delighted last year that your pioneering Irish American spirit and commitment to equality lead you to the historic decision to admit women members. I salute that decision," Mr Kenny say. He added that Ms Anderson's record of service is "stellar". The Taoiseach will attend the St Patrick's Day parade in Philadelphia today before moving to Boston.